Like, I’m not that into fashion or whatever. I try to dress cool but only so I can infiltrate the cool kids circle and date their women. But I don’t read about fashion nor do I know who any designers are, really. There are many more, but these are the ones I recognize because all the designs plaster the logo across the front. Anyway, thanks Christian Audigier for bringing skulls, flames, and “tribal” designs (back?) to the mainstream. 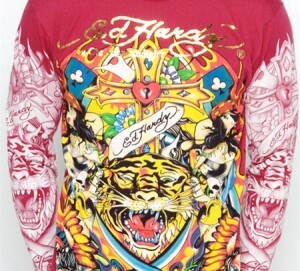 I’m sure it’s really passé to hate on Audigier but people still wear his clothes so whatever. This is my girlfriend, Denise. She’s literally retarded. Yeah, those are snakes on my jeans, what of it? 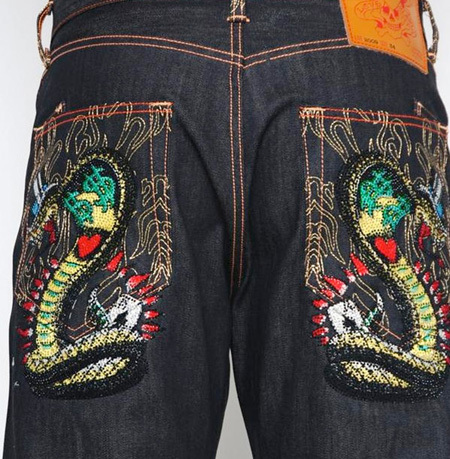 Yeah, I paid $250 for my snake jeans, what of it? You are currently reading "CHRISTIAN AUDIGIER MUST HANG by Benjerman F. Nyberger"